TIKAPUR, Oct 12: Locals of Tikapur Municipality have expressed disappointment over the municipal authority for dumping garbage in a dolphin conservation area. A few days ago, a tractor of the municipal office had apparently deposited garbage collected from various places of the municipality on the banks of the Karnali River where dolphins are being conserved. The dumped sewage has not just poisoned the water but has also put the life of these rare aquatic species at risk of extinction. After the locals protested, the municipality office stopped dumping garbage there. But still one can clearly see piles of sewage on the banks of the river. Kalu Hamal, a tourism entrepreneur who has long been involved in conserving dolphins, says he is extremely critical of the municipality office's decision to dump garbage in a conservation area. The large mass of waste deposited on the banks can anytime enter the river and affect the dolphins. "Through the dolphin conservation campaign, we are trying to attract more tourists to Nepal. The municipality office should co-operate with us," he said. Despite obstruction from some locals, tractors had forcefully dumped garbage on the riverbanks. It is sad that even after efforts to create awareness among the people about the conservation area, many are still unaware about it, laments Shiva Rawal, a local. However, the municipality officials state that they had no intention of harming the dolphins. The municipality office has been looking for a dumping site for a long time, but it has not yet found a suitable place. As a result, it has been throwing the garbage haphazardly. Tapendra Rawal, mayor of Tikapur, informed Republica that the municipality office is searching for a proper place for dumping the garbage. "We have no plans to convert the conservation area into a dumping site," he said. As stated by some locals, the municipality office has recently started throwing garbage in a forest which lies nearby a Tikapur park. Visitors can see dolphins all year round, informed tourism entrepreneur Hamal. 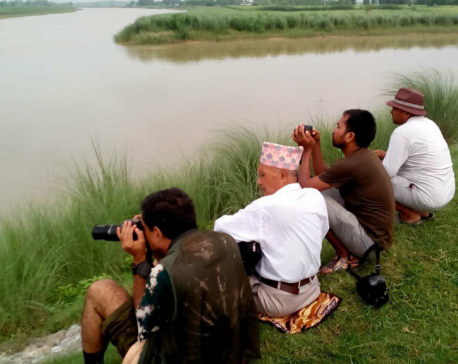 A study conducted this year showed the presence of a high number of dolphins in Karnali.